Found next door to the Surin Bay Inn just a few minutes’ walk to the beach, this modern, cheerful 29-room hotel with a rooftop terrace is a good alternative if Surin Bay is booked up. Average rating 7.5 from 206 reviews. For the standard rooms, book one at the back if you want to save money, or take a front room if you’re keen to have a balcony with a sea view in the distance. The streetside rooms also have a small seating area just inside the balcony. Larger suites have the best views and a bathtub in the bathroom. Every room comes with air-con, cable TV, minibar, safe and kettle and hot water showers, with a choice of twin or double beds. Just outside the entrance to each room is a rack holding an umbrella, a thoughtful feature. Rates below include WiFi but not breakfast, though packages with breakfast included are available if you book online. During our visit in July 2015 a building was under construction directly behind the building, and the park across the road was being dug up for a waterworks project. Be sure to check before booking if you’re not keen on daytime noise. 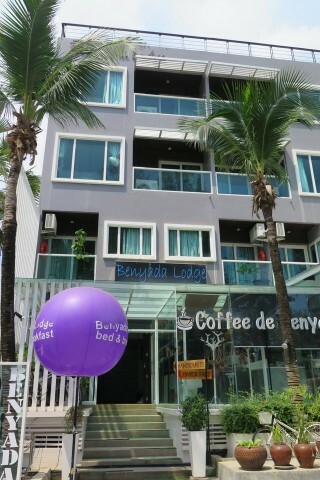 Check rates at Benyada Lodge on Booking.com.